The path taken by an electric current in flowing through a conductor through one complete run of a set of wires from a power source, such as a panelboard, to various electrical devices and back to the same power source. The wires used for various circuits are prescribed by codes, such as the National Electrical Code. A complete wire, radio, or carrier communications channel. A general term referring to a system or part of a system of conducting parts and their interconnections through which an electric current is intended to flow. A circuit is made up of active and passive elements or parts and their interconnecting conducting paths. The active elements are the sources of electric energy for the circuit; they may be batteries, direct-current generators, or alternating-current generators. The passive elements are resistors, inductors, and capacitors. The electric circuit is described by a circuit diagram or map showing the active and passive elements and their connecting conducting paths. Devices with an individual physical identity, such as amplifiers, transistors, loudspeakers, and generators, are often represented by equivalent circuits for purposes of analysis. These equivalent circuits are made up of the basic passive and active elements listed above. Electric circuits are used to transmit power as in high-voltage power lines and transformers or in low-voltage distribution circuits in factories and homes; to convert energy from or to its electrical form as in motors, generators, microphones, loudspeakers, and lamps; to communicate information as in telephone, telegraph, radio, and television systems; to process and store data and make logical decisions as in computers; and to form systems for automatic control of equipment. 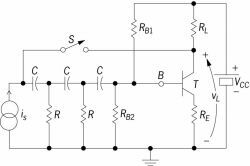 Electric circuit theory includes the study of all aspects of electric circuits, including analysis, design, and application. In electric circuit theory the fundamental quantities are the potential differences (voltages) in volts between various points, the electric currents in amperes flowing in the several paths, and the parameters in ohms or mhos which describe the passive elements. Other important circuit quantities such as power, energy, and time constants may be calculated from the fundamental variables. For a discussion of these parameters. An interconnection of electronic devices, an electronic device being an entity having terminals which is described at its terminals by electromagnetic laws. Most commonly these are voltage-current laws, but others, such as photovoltaic relationships, may occur. Fortunately, most of these transistors occur in pairs, such as the npn and the pnp bipolar junction transistors, or the n-channel and the p-channel MOSFETs, allowing designers to work symmetrically with positive and negative signals and sources. This statement may be clarified by noting that transistors can be characterized by graphs of output current i versus output voltage v that are parametrized by an input current (in the case of the bipolar junction transistor) or input voltage (in the MOSFET and JFET cases). Typically, the curves for an npn bipolar junction transistor or an n-channel field-effect transistor are used in the first quadrant of the output i-v plane, while for a pnp bipolar junction transistor or a p-channel field-effect transistor the same curves show up in the third quadrant. Mathematically, if i = f(v) for an npn bipolar junction transistor or n-channel field-effect device, then i = -f(-v) for a pnp bipolar junction transistor or p-channel field-effect device when the controlling parameters are also changed in sign. Transistors are basic to the operation of electronic circuits. Bipolar transistors have three terminals, designated as the base B, the collector C, and the emitter E. These terminals connect to two diode junctions, B-C and B-E, these forming back-to-back diodes. The B-E junction is often forward-biased, in which case its voltage is about 0.7 V, while the B-C junction is reverse-biased for linear operation. Besides biasing of the junctions for linear operation, any state of the two junctions can occur. For example, both junctions might be forward-biased, in which case the transistor is said to be in saturation and acts nearly as a short circuit between E-C, while if the junctions are simultaneously back-biased the transistor is said to be cut off and acts as an open circuit between all terminals. The transistor can be controlled between saturation and cutoff to make it act as an electronically controlled switch. This mode of operation is especially useful for binary arithmetic, as used by almost all digital computers, where 0 and 1 logic levels are represented by the saturation and cutoff transistor states. MOSFETs have three regions of operation: cutoff, saturated, and resistive. The MOSFET also has three terminals, the gate G, the drain D, and the source S. A key parameter characterizing the MOSFET is a threshold voltage Vth. When the G-S voltage is below the threshold voltage, no drain current flows and the transistor is cut off. The MOSFET is a versatile device, acting as a voltage-controlled current source in the saturation region and approximately as a voltage-controlled resistor in the resistive region. It can also be electronically controlled between cutoff and the resistive region to make it act as a switch, while for small signals around an operating point in the saturation region it acts as a linear amplifier. Another feature of the MOSFET is that, besides the categories of n-channel and p-channel devices, there are also enhancement- and depletion-mode devices of each category. In practice, for electronic circuit considerations, an n-channel device has Vth > 0 for enhancement-mode devices and Vth < 0 for depletion-mode devices, while the signs are reversed for p-channel devices. Because most signals in the real world are analog but digital computers work on discretizations, it is necessary to convert between digital and analog signals. As mentioned above, this is done through digital-to-analog and analog-to-digital converters. Most approaches to digital-to-analog conversion use summers, where the voltages representing the digital bits are applied to input resistors, either directly or indirectly through switches gated on by the digital bits which change the input resistance fed by a dc source. One means of doing analog-to-digital conversion is to use a clocked counter that feeds a digital-to-analog converter, whose output is compared with the analog signal to stop the count when the digital-to-analog output exceeds the analog signal. The counter output is then the analog-to-digital output. The comparator for such an analog-to-digital converter is similar to an open-loop operational amplifier (which changes saturation level when one of the differential input levels crosses the other). Other types of analog-to-digital converters, called flash converters, can do the conversion in a shorter time by use of parallel operations, but they are more expensive. 1. A continuous electrical path, or a system of conductors, through which an electric current is intended to flow. 2. An assembly of pipes and fittings, forming part of a hot-water system, through which water circulates. A communications path in a circuit switching network. The test circuit, which was composed of a test lung, a pneumotachometer, a breathing circuit and a ventilator, is shown in Figure 1. It is a novel solution to the problem of breathing circuit condensation and supports Teleflex Medical's mission and vision to enhance patient outcomes by providing products that help reduce infections and improve patient safety. Their topics include risk assessment, anapestic breathing circuits, inadvertent awareness under anesthesia, obstetric anesthesia, mechanical ventilation of the patient, and accountability in perio-operative practice. As well as oxygen and aerosol therapy products, Flexicare also manufactures and supplies a wide range of other items, including anaesthetic breathing circuits, as well as a range of urology products for the UK and foreign markets. The selection of breathing circuits, Concha([R])Column and accessories are designed to support a wide range of ventilation strategies for the critical care infant. The Global Respiratory Devices Market is segmented on the basis of Diagnostic and Monitoring Devices (Spirometer, Sleep Test Devices, Peak Flow Meters and Pulse Oximeters), Therapeutic Devices (CPAP Devices, Bi-PAP Devices, Humidifiers, Breathing Circuits, Nebulizers, Oxygen Concentrators and Ventilators), Disposables (Masks, Cannulas, Tubes, and Filters) and Region (North America, Europe, Asia Pacific and Rest of the World). Electronic auction: purchase of medical products "sle5000 and babylog800 plus single-use breathing circuits, sets for setting deep venous lines, umbilical radiopaque double-lumen catheters"
This report analyzes the worldwide markets for Anesthesia Disposables in US$ Million by the following Product Segments across all regional markets: Anesthesia Breathing Circuits, Endotracheal Tubes, and Anesthesia Gas Masks. The major product segments analyzed are Anesthesia Breathing Circuits, Endotracheal Tubes, and Anesthesia Gas Masks. the framework will be structured in the following categories: anaesthesia breathing / anaesthetic systems and accessories endotracheal tubes and accessories oxygen therapy - capnography resuscitation breathing circuits and accessories breathing filters and accessories cpap sets & kits endobronchial tubes and accessories laryngeal masks airways laryngoscopes nasopharyngeal airways oropharyngeal airways the framework agreement will be available to the hse and those organisations referred to in appendix 3 of the itt. In this research, Frost & Sullivan's expert analysts thoroughly examine the following markets: breathing circuits, breathing filters, heat and moisture exchangers, endotracheal tubes, laryngeal masks and tracheostomy tubes.